Open Engagement is an annual conference exploring diverse perspectives in social practice. In 2014 OE focused on the theme of Life/Work, with keynote speeches by amazing artist-mothers Mierle Laderman Ukeles and J. Morgan Puett. The conference also featured Human Hotel, an evolving project by the Danish group Wooloo, providing free housing for conference attendees traveling with their families as well as on-site daycare. 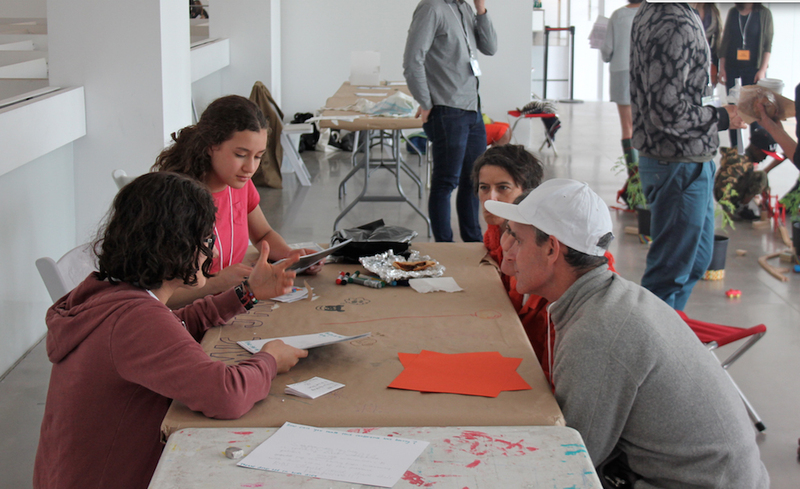 We got a full report from artist Alberto Aguilar and his family, who between the six of them managed to participate in just about every aspect of the event from childcare and housing to a group performance and conversation for the conference itself. 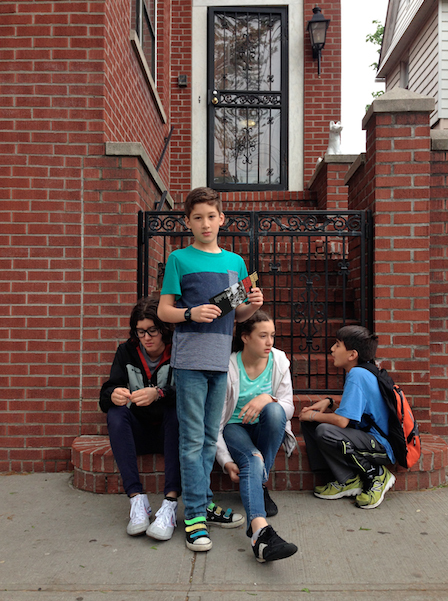 On the steps of the Louis Armstrong House Museum, Queens, New York. Madeleine and Isabella discussing daycare polls with conference attendees. Our family was invited to be part of a conference called Open Engagement in Queens, New York. Our family had to do a presentation about integrating family and art. I presented a power point, which I made on the timeline of my dad’s art. There was another project going on called Human Hotel. It was a project that provided homes for families that were part of the conference. Our human hotel family was Joel and Avi Koepel. They were wonderful hosts. At the Queens Museum there was a daycare, where my siblings and I stayed most of the time, and what we did at the daycare was play games, go outside, see a diorama of New York City, and we had a small picnic. At the end of the daycare we had this paper asking 1 question: how can you make the conference less boring. Many people gave in answers. My sister and I read these aloud to strangers and conference people and we would just talk about it with them. We had a great time in New York. We went and explored as much as we can. This was the most impactful and favored trip we ever took. We arrived in New Brunswick, New Jersey late evening. I remember all of us being nervous to meet the strangers who graciously opened their home to us. When we pulled up we saw a man sitting on the front lawn awaiting our arrival. We all got out of the van to introduce ourselves and extended our hands to him — and Joel said, “Give me a hug!” That was the beginning of a beautiful friendship. Avi gave us a warm welcome as soon as we walked into the house. Open Engagement Daycare organized by Wooloo. 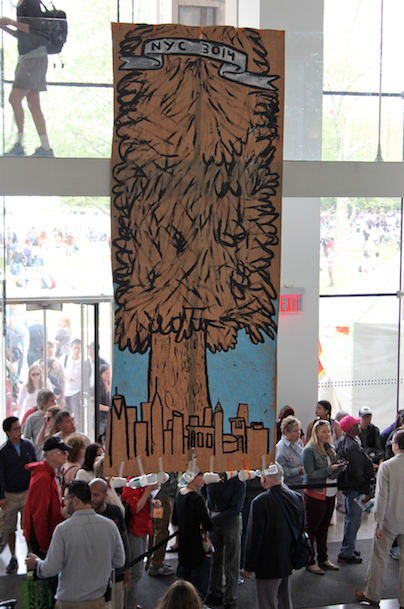 Each child was given a redwood tree to take home and plant and imagine it in 3014. It was urgent that we visit the Louis Armstrong museum that also happened to be in Queens, just a few blocks away from the Queens Art Museum. Joaquin’s part of the presentation was reciting a biography on Louis Armstrong inspired by a recent project he did for school. Joaquin was really excited to learn even more about Louis Armstrong’s life and influences. I think we all left the museum transformed and inspired. There were even times during the tour I wanted to cry. Saturday we arrived to the Queens museum early so we could meet Martin [Rosengaard] of Wooloo and set up for the workshops we were leading at the daycare. Martin was so nice; we all talked a little bit about what we were going to do and then started setting up and making things. I remember at one point he said “I love how your kids just work so well together.” It’s funny how I don’t even notice, I’m so used to them making stuff together all the time I’ve become immune to it — but I realized at that moment that I am truly amazed by them. We spent the entire morning at the daycare. There were very few kids (most of them were our kids) but we had a great time just creating with them. Martin had bought little Redwood trees, about 30 of them spread out in this beautiful space. We all went outside to eat our boxed lunches by the empty fountain in the back of the museum. We took our Redwood trees outside with us, too. 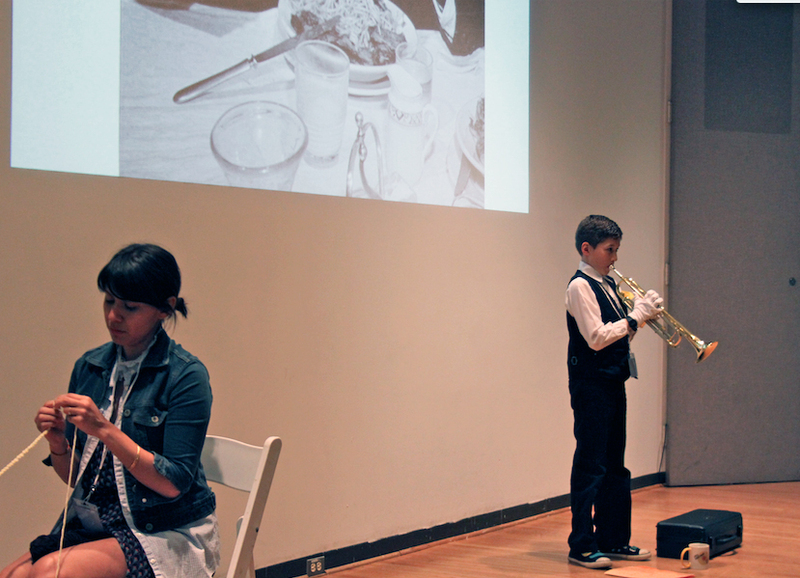 Integrating Family Life and Art Making: Sonia finger knitting and Joaquin playing trumpet as Louis Armstrong. After lunch it was time to prepare for our presentation. We sort of had an idea of what we were going to do, but nothing is ever certain and decisions are made as we’re going along. Paolo was the last one to figure out what his contribution to the presentation would be. He put one of the empty lunch boxes over his remote control car and drove it around the stage during the performance. That was perfect for him because he loves his remote control car. You couldn’t tell there was a car under the box so it was funny seeing everyone’s reaction to a moving lunch box. When we first went to the Queens Museum we got our name tags to get in for the three days. The second day we went to the kid’s daycare. 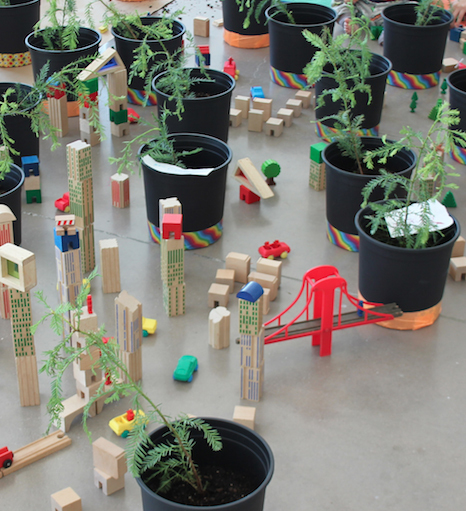 There we made a city out of blocks around the redwood trees that Martin gave us. Martin picked a great house and company and people for us to live with. Whenever we asked Joel and Avi for something they gave it to us, whenever we asked to help them they said no let us do it. They were super nice. They also had a cute dog named Daisy. Sometimes she was feisty and sometimes she was nice. She cared about Avi but not as much as she cared about Joel, her daddy. The third day we did our presentation. My dad sang a one-minute song. My sister talked about pictures of our family. My brother and sister sang together and then my mom sewed or something and I was barely in it. I just moved a remote control car during my sister’s talk and it was the end of our presentation. I did not really like it because I did not do anything. But everything else was great. When the GPS read that there was only 1 minute until we reached our hosts’ house, we were all terrified. By that time, we had already walked around New York City and it was the most amazing place I had ever been. Everything felt so different — like another country, but it wasn’t. That’s what made it so amazing; I didn’t know that a city like that could exist in America. We were getting closer and closer to the house and it was night. The little destination flag was right in front of us, and we started driving really slow. We didn’t know how the house looked or how our hosts looked. Every house we passed could be the one we were staying in. I would look at a house and tell myself “ok, that one wouldn’t be too bad,” or, “ I’d be fine if it was this one”. We’ve had many bad experiences staying in strangers’ homes – relating to shedding cats, dead bugs, and lots of dust- so I was just trying to make myself feel better. But when my dad pulled into the house, I didn’t need to try to be optimistic. Everything about it was welcoming and beautiful, and it was filled with light. Joel was waiting outside to meet us with Daisy, their dog. We talked with him outside for a long time before he took us inside to meet his wife, Avi. They cleaned the whole house and swept the porches just for our arrival. They offered us Klondike bars and ice cream sandwiches, mangos and grapes. Joel was so happy when my dad taught him his special mango cutting technique. They set up mattresses in the basement for us to sleep on. They had a Ping-Pong table down there and we played it every night. Every morning we ate breakfast together. The light was so beautiful in their house in the morning because they had windows on their ceiling. One morning we ate bagels and smoked salmon outside on their porch. The salmon looked squishy and red so I didn’t think I’d like it, but I tasted it anyways and it was so good. On our last day together, my dad made mole and rice and beans. They loved it, especially the mole. That night my brother and I performed music for them. They were so happy, they asked for an encore. We all stayed up late that night talking because we knew that we had to say goodbye in the morning. It was really hard to say goodbye.We were getting closer and closer to the house and it was night. The little destination flag was right in front of us, and we started driving really slow. We didn’t know how the house looked or how our hosts looked. Every house we passed could be the one we were staying in. I would look at a house and tell myself “ok, that one wouldn’t be too bad,” or, “ I’d be fine if it was this one”. We’ve had many bad experiences staying in strangers’ homes – relating to shedding cats, dead bugs, and lots of dust- so I was just trying to make myself feel better. But when my dad pulled into the house, I didn’t need to try to be optimistic. Everything about it was welcoming and beautiful, and it was filled with light. Even though most days we were busy with the conference and exploring New York, it was so nice to come back home to our friends in their nice, quiet neighborhood, far from the city, to hear their funny stories and to tell our stories as well. I loved spending time with Joel and Avi, and it’s weird to think that it was coincidental events that brought our families together so perfectly. Upon entering the Queens Museum to register for the conference the attendant asked for our names and was surprised to hear that we were all presenters and each had an assigned name tag. 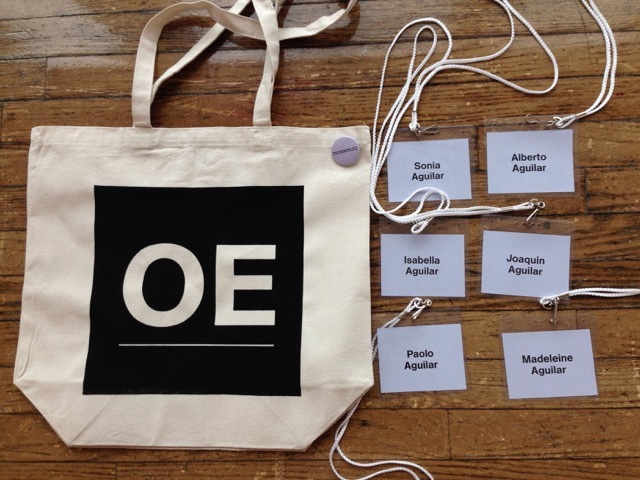 She then gave us each a canvas bag with a big OE on it that was filled with gifts and the conference program. This made my kids really excited. The Queens Museum is building is the site of the 1939 and later 1964 World’s Fair. From 1946-1950 this building also housed the General Assembly of the newly formed United Nations. The crown jewel of the Queens Museum is a miniature scaled model of New York City that was built for the 1964 World’s Fair. 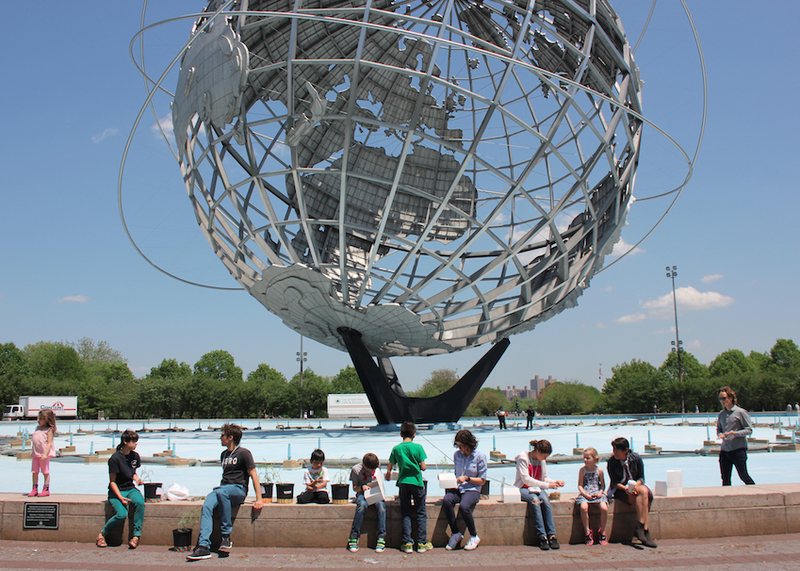 On the second day of the Open Engagement conference their was a 75th and 50th anniversary festival of the NYC World’s Fair that took place in the park outside of the Queens Museum and brought a great crowd into the building while the conference was happening. We ate at a Mexican Restaurant in Queens that makes fresh tortillas daily and provides them for many restaurants around New York City. After enjoying our food there I gave our server a pack of El Milagro tortillas from Chicago that I had in the van as a gift for our host family. In exchange he gave me a free pound of his fresh tortillas in gratitude, which we ate at a meal that I made for Joel and Avi on our last night in their home. As a teenager Avi went to Denmark as an exchange student where she formed a strong bond with her host family there that continues until this day. On Avi’s advice, her daughter Dana also went to Denmark her first year out of high school. There she interned for Martin Rosengaard, the founder of Wooloo, the group that runs Human Hotel, which arranged our housing with Joel and Avi Kopel in New Jersey. They treated us with great hospitality and made us feel at home during our time at the conference. Our children love them dearly. 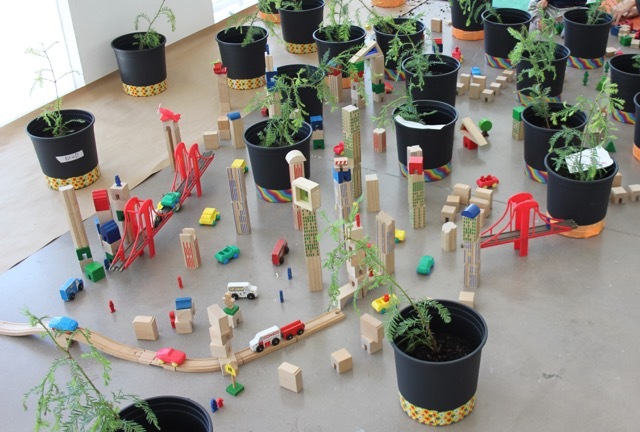 As part of the daycare in the conference each of our children was given a redwood tree to plant and imagine in the year 3014. We brought two of these home to Chicago, gave one to Joel and Avi and the other to my friend Clintel Steed whom we visited in Brooklyn. This essay has been published in partnership with Cultural ReProducers and was first published in two parts on their site here and here.